When you're planning a wedding, costs really add up. 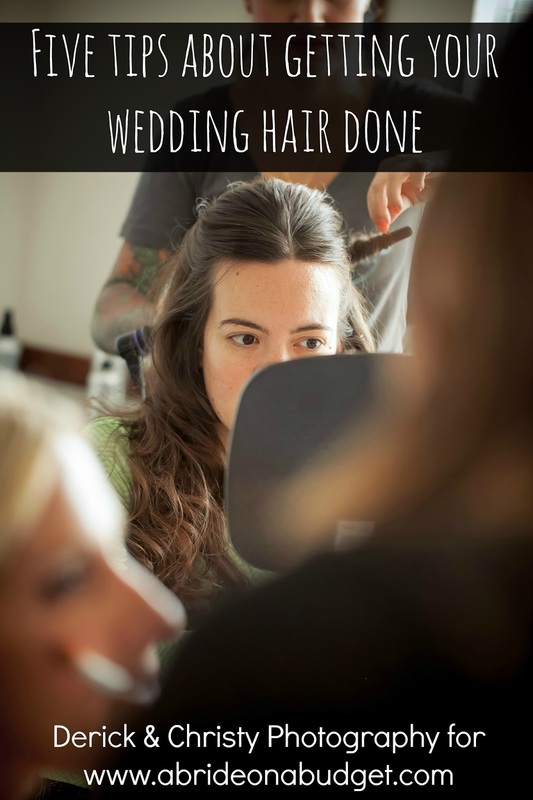 There's so much to pay for and you really don't want to pay for everything but brides don't know what they can cut. When brides ask me, they always ask if they can skip favors. I'm totally against that. I really like favors. I think you should give your guests a token from your wedding: a personalized wine glass, a cookie, some sort of thank you for coming. Don't skip that. You guests will notice. But there are a lot of other things you can skip (and save money by doing so) and no one will even realize you did. Champagne is about $3 a glass, so that's an extra $300 per 100 guests. That's a lot of money (pretty much equal to the favors everyone wants to cut so quickly). 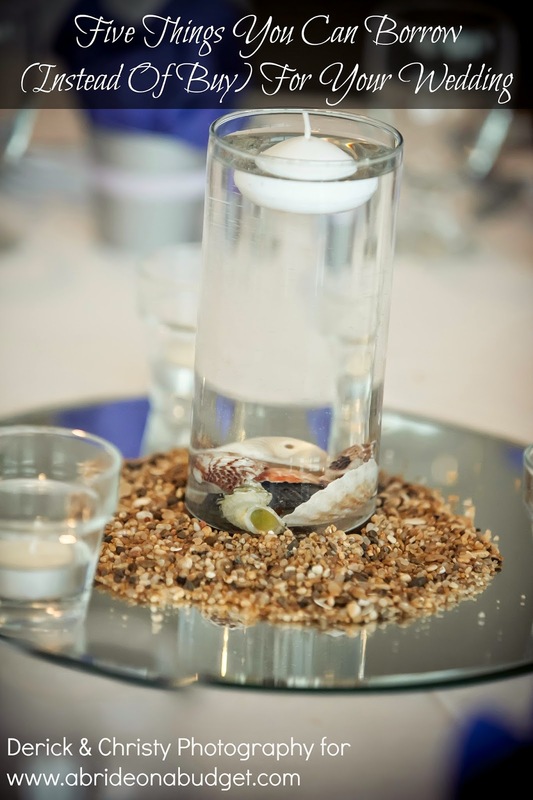 But, let's think logically about what happens with the champagne: It's poured before the reception starts and is left at each plate, next to the water. It's there when you guests walk in, but can't be enjoyed until the best man says his toast. Which is after dinner and often after the bouquet throw and the garter toss. And it's always after your guests have had plenty of time for trips to the (open) bar. So, after a trip, your guests have a drink in their hands and the best man or maid of honor makes it to center stage to make a toast. Instead of running back to the table to grab that two ounce glass of champagne that's been warming all night, your guests listen to the speech and toast you with the glass in hand. The wait staff comes around after the toast, dumps the leftover, and there, at $3 a glass, your money is being poured away. If you remember the post about my flowers, you remember that I had a cascade bouquet. It was absolutely not something that I wanted to throw across the dance floor when I was facing the opposite direction of the potential receivers. So I ordered a toss bouquet, made in our wedding colors. The florist brought the bouquets to the church and, after the ceremony, the toss bouquet was left behind ... along with all of the vases that the bridesmaids bouquets were accompanied by. No one thought to grab my toss bouquet and bring it with us. When it was time for me to do the bouquet toss, I grabbed one of the bridesmaids' bouquets and tossed that. No one even knew I didn't toss the toss bouquet, and no one said anything about me not throwing the bridal bouquet. If you haven't heard of bathroom baskets, they're basically baskets that you stock with items that your wedding guests might need in case of a minor emergency (nail files, aspirin, feminine products, lotion, etc.). If you spend a few minutes requesting free samples from brands when they're available, you can pretty much fill these for free. But, if not, you can spend a couple dollars picking items up from the dollar store. The chance of your guests actually using these items is slim, which would leave you with a bunch of stuff that you really don't need. And, really, if your guests break a nail, they can wait a couple hours to file it. It won't be the end of the world. I never realized how much I would think about chairs. Did we want traditional ballroom chairs, did we want to upgrade to white resin chairs, or did we want to pay for chair covers? Changing the chairs was $2.50 and adding covers was $3 each. Yes, the chair covers look nice, but worth it for $3 per chair? No. Absolutely not. I really love the look of white resin chairs, but not for that price. The ballroom chairs would work just fine. And that's what I picked. We went for our tasting and the on-site coordinator mentioned that there was a wedding the night before ours and they were thinking about upgrading to the white resin chairs. She could leave them for us, free of charge. So I said sure. And then, a few days before the wedding, she said the wedding before ours was using chair covers and they could leave them for us for free. So here I was, making a third decision about chairs. Crazy. We ended up with chair covers, and they looked really nice, but if I asked our guests (the ones who didn't know about my trio of chair decisions, anyway), I doubt they would actually even know that they had covers on them. Upgraded chairs look nice, but as long as you have chairs, that's all that matters. We live in a day and age where directions are easily accessible. There's a good change you have a GPS or a smart phone with a GPS (or, you're like us and have both). Chances are, your guests do too. So sure, you can throw an antiquated directions card into your invitation, but your guests probably won't use it. You can modernize it with a personalized map card (although that wouldn't help you savings-wise). Instead, you can just leave it out altogether. As long as you have the address of the ceremony site and the reception venue on the invitation, your guests will find their way there. You can save yourself the cost of the entire component (both design costs and printing costs) plus, your invitations will be a little lighter and that may be the bit of paper that is the difference between costs of stamps. 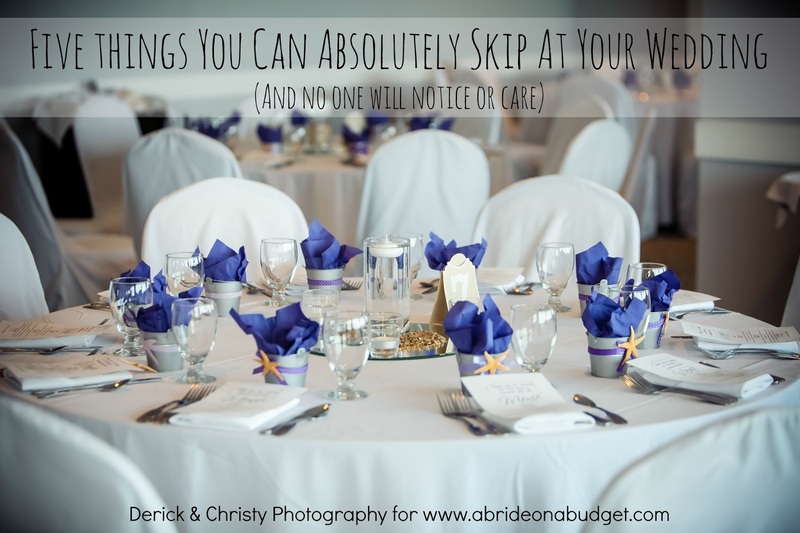 BRIDAL BABBLE: What is something you can absolutely skip a your wedding that you don't think your guests will notice? Planning your wedding? Don't miss any of our tips. Be sure to sign up for our email list below. Five Things You Can Borrow (Instead Of Buy) For Your Wedding. I agree you can skip all these. These are all great! Especially the champagne toast- such a waste of money! I agree with these although I cant imagine doing a toast without champagne no matter how cheap tasting it may be...Im old school when it comes to that one! Its true you can absolutely skip these steps I sure did. Don't forget that you can skip any traditions that you don't find meaning in. (Sand ceremony, garter toss, a big cake or whatever!) All good points that you can skip! I skipped a couple of these at my wedding. In did like having the bathroom basket though. It was really helpful for some poeople. Considering I had none of these at my wedding, I concur wholeheartedly with your list. :) I think in this day and age of Pinterest and Instagram, brides get caught up in doing it all. As a result, they blow their budget and are in debt after the wedding. Learn something new every day...I have never heard of a bathroom basket before. lol. I agree...people will definitely notice if you skipped the favors. I agree with the chair covers too. I'm def not doing the toast, toss or direction cards. I agree with you on all of these. I still believe favors are a waste because usually people leave them behind but if you feel strongly about it and the favor is something fun or delicious then I say go for it. I too would do without the favors..In fact I have been to several weddings that had no Favors never gave it a second thought. You could make all the center pieces and tape a note underneath one chair at each table.Than when the night is almost over announce that who ever has the taped note under the chair gets to keep the center piece! Now a days I would also make my own invitations. That would save a Bundle.. Thanks for the kind words, Marti. I'm glad your wedding was wonderful without me. That definitely proves my point =] These are nice, but absolutely not necessary. I agree - excellent tips for keeping the cost down. A friend had just a few driving direction inserts that she printed herself, ready to offer those who asked for directions when they RSVPed. Every family has a few who have not embraced the computer and some who believe that GPS will give wrong turns into the river. Cool post. The last wedding I went to didn't even have a cake and I don't think anyone really noticed. I absolutely agree with you. Spending your budget on something of poor value is not the best way to go (and certainly not what we recommend!). Great tips! I'm still not sure about favours, though. My fiance and I are budding minimalists and giving people cheap things they likely won't want doesn't sit well with me. Congrats on planning your wedding Elizabeth. Instead of giving a trinket, you can always give out food (large chocolate-covered pretzels, chocolate-covered graham crackers, homemade trail mix that says happy trials). I don't know very many people who would refuse a snack after a long day of dancing and celebrating!